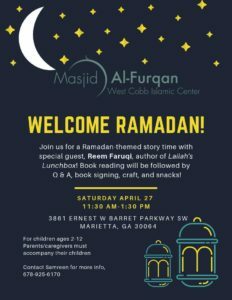 Masjid Al-Furqan – West Cobb Islamic Center (WCIC) serves as a Masjid, a Sunday school, and a gathering place for West Cobb County Muslim community. 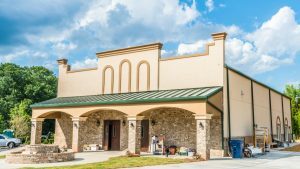 Located on Ernest Barrett Parkway in Marietta, the facility offers a Musullah (prayer hall) area with sections for men and women and a dedicated play room for children under the age of ten. 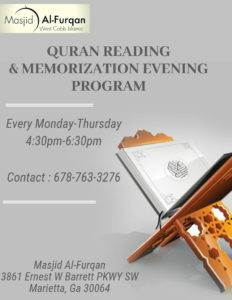 Masjid Al-Furqan offers regular five daily prayers and Jumuah (Friday) prayer services. 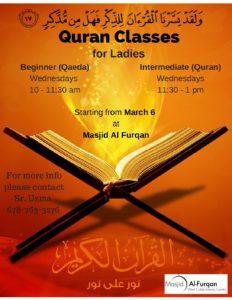 WCIC runs Sunday school for Muslim children and youth. The masjid collects Zakaat and Sadaqah (alms and charity) and distribute the funds to provide for the needs of the community members, social services, and refugee assistance. 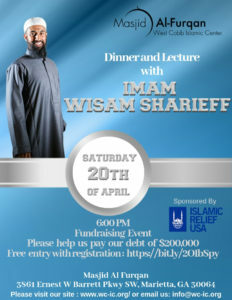 Masjid Al-Furqan WCIC organizes community picnics, hiking at the Kennesaw Mountain National Battlefield Park, and community outreach with the Christian and Jewish communities. For Children Ages 2-12 – Must be accompanied by parent/caregiver. Contact Samreen for more information. Masjid Al-Furqan Sunday School would love to invite parents, families and the community to its second Graduation ceremony. Please join us to celebrate and encourage our young students, teachers and volunteers on Sunday, April 28 at 11 a.m. Volunteer parents and teachers will host a community luncheon after the ceremony. The enrollment in the Sunday school has been steadily growing, participation has gone up by 50 percent and we are operating at our full capacity. However, we are having to refuse accepting new kids because we do not have enough volunteers. We desperately need more teachers. Please consider to volunteer as a teacher. I encourage our young professionals and college students to consider teaching as this is the best form of Charity (Sadaka e Jariah). Please do not hesitate to contact BrotherAsif Edrish, Administrator Sunday School, at his cell number 678-559-9444 if you have any questions. For more information email at info@wc-ic.org or call 678-763-3276. If you own a business and would like to advertise while still helping the masjid, your masjid now offers an opportunity for you. 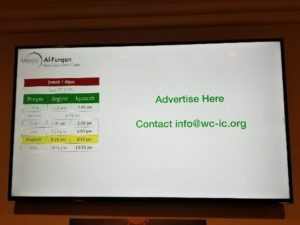 You can now advertise your business on the Masjid Announcement Board which is located in the Masjid Al-Furqan lobby. Packages start from $50 per month. For more information contact info@wc-ic.org.